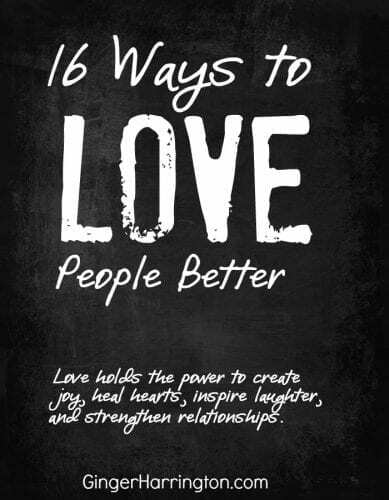 Focus on the power of love with 16 ways to love people better. 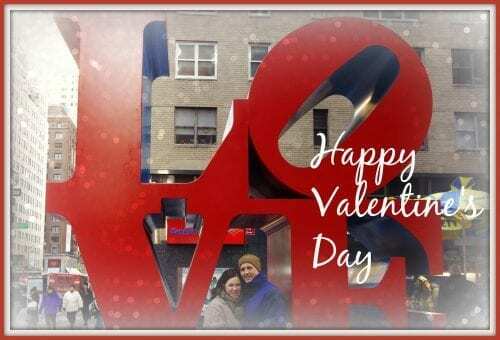 As February 14 approaches, maybe you’re thinking about how to show a little extra Valentine’s-Day-Love to those special people in your life–husbands, kids, parents, and friends. Flowers, candy, cards, and teddy bears–who doesn’t enjoy these fun ways to show your Valentine how much you love them? It’s the love expressed by the gift that matters. Love holds the power to create joy, heal hearts, inspire laughter, and strengthen relationships. We all need to know that we are loved. However, God’s Word makes it clear that loving others is a big deal. Love is not all about me. When our focus is on ourselves, we’re all about getting our need for love met in just the way we like it. It is the love of Christ that frees us from the “what’s-in-it-for-me” mindset in our relationships. We don’t like to admit it, but we all struggle this self-oriented thinking at least some of the time. 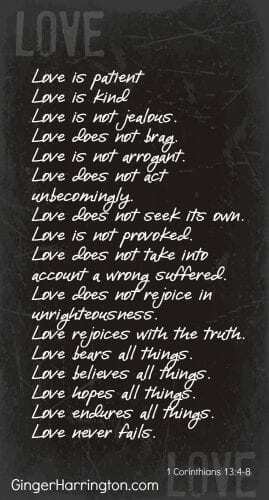 The powerful love is best described in 1 Corinthians 13. Consider these 16 ways to love others better. I’ve written these verses as a list. None of these ways to love comes naturally. Patience is rarely easy and kindness is too often simply a good intention when tempers flair or words hurt. The word love in this passage is translated in the Greek as agape. This is a self-giving love without expecting anything in return. Agape is love that can be given to the most undeserving folks. Think of the meanest person you know–agape can love them. It is a love that carries on even when disappointed or rejected for it doesn’t love in order to get. This agape love is far more than a feeling for it chooses self-denial for the sake of someone else. When my life is all about me, agape is impossible. It is the power of Christ that frees us from the deep need that wants to love in order to get, to love for the sake of self. Love is where the spiritual meets the practical in our busy lives. How do we get beyond the cards and the candy, the feelings and the Word’s of Scripture to expressing agape in our thoughts, words, and actions? Choose to love in the nitty-gritty daily moments that make up your day. When the husband forgets to take out the trash, choose patience. When you are frustrated, choose kindness. Receive this agape from Christ, and let it flow out to those around you in the choices you make. Filling up with God’s love energizes the words you say and how you spend your time. When your friend seems to have the perfect home, refuse to be envious. When love is difficult, hold on to hope. Thought by thought, word by word, and action by action let love seep out of your conversations. Love softens your touch and brings strength to your convictions. Let love inspire the words you say and how you spend your time. Seek love in your actions and the decisions you make. Take it one moment at a time, depending on Christ to empower you to give your very best self in loving others. Even as I have loved you...there is only one place to find agape. Only one source for the love we crave. 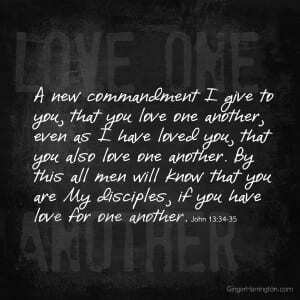 Receive the powerful love of Christ and choose to love one another well. Five Loving Things You Can SAY to Your Man at Valentine’s. Inspiring words for loving your husband. Crafty fun Valentine ideas that aren’t candy. Ideas for showing love to your kids. I’m hanging out with these blogging communities: #RaRaLinkUp , #TellHisSTory, and Three Word Wednesday. 1 Corhinthians 13:4-8, Ideas for Valentine's Day, Love, Love One Another, Valentine's Day. Bookmark. Are You Going to Believe What You’re Feelings are Telling You? Happy Valentine’s day to you as well! Can’t ever have too much love.